Dec. 10, 2014 1:00 p.m. The Christmas spirit swung into full force in Wetaskiwin at 5:30 p.m. on December 8th, 2014 with the arrival of the Canadian Pacific Holiday Train 2014. The train began its journey to raise awareness of the issue of hunger prevalent in all communities, in Montreal, Quebec, on November 27th and will conclude its mission on December 18th in Port Coquitlam, B.C. As darkness descended on the City, a steady stream of vehicles converged on 4009 – 50 Street in anticipation of the arrival of the fourteen cars that stretched some 1000 feet. All the cars were decorated with a dazzling display of hundreds of thousands of technology-leading LED lights and holiday designs. 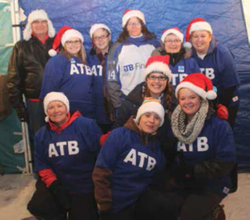 As the train pulled to a halt, hundreds of seniors, families, small children and babies quickly adapted a holiday spirit among the dazzling light display while enjoying the hot chocolate and cookies courtesy of ATB Financial. Soon a stage opened up in the side of one of the box cars and the live Canadian power pop rock band, Odds starring Roxanne Potvin, played to the delight of the audience. The event was a ‘season to be jolly’ as C.P. Railway donated $4000 to the Salvation Army Food Bank. Family after family made their way to the WCTS bus and dropped off hundreds of pounds of food for the local Food Bank. Generous residents of Wetaskiwin and region also dropped off cash in the Salvation Army kettle also in support of the local food bank. Mayor Bill Elliott brought greetings and thanked everyone and offered his personal thanks and thanks on behalf of the City for contributing to the festive season. In December, 1999, CP began running a freight train across Canada that was decorated with thousands of Christmas lights. The tradition continued. The goal of the Holiday Train is to collect food and money for local food banks and to raise awareness in the fight against hunger. At each of approximately 150 communities, CP makes a corporate donation and encourages local residents to donate food and funds, all of which stays in the community. Food Banks Canada recommends the following products when making a donation to the Food Bank: pasta products & rice, canned meats and fish, dry and canned soups & stews, canned fruit & vegetables, breakfast cereal, peanut butter, canned/powdered milk, fruit juices, pasta sauce, beans & legumes and baby food.